OPEN HOUSE Friday March 10 2:30-6PM. Stunning 4 bedroom inner city town house! Elegant & contemporary design meets function in the open-concept layout, with a spacious living room centering on a floor-to-ceiling gas fireplace; the kitchen features a large island that is perfect for entertaining, lots of counter space and stainless steel appliances, inc a gas countertop stove & built-in oven. The adjacent dining area is spacious, with an office nook/ homework corner, while the powder room is convenient for guests. Three bedrooms up, the master retreat is a truly spacious haven, with a luxurious ensuite. The lower level development showcases a versatile family room with granite wet bar & fridge & the 4th bdrm, with its own ensuite. There's a single car garage & plenty of street parking. 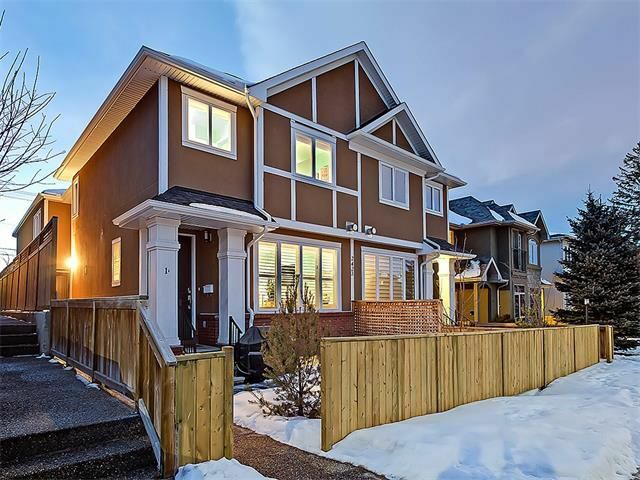 This perfect home is centrally located, close to 17 Ave, you can walk to the ctrain and shops! Call to arrange an exclusive viewing now & see yourself living in this virtually new townhouse, in sought after Killarney!